Rowing boats (shells) and equipment these days are pretty hi-tech while still very basic. Shells can have one, two, four, or eight rowers. See the Shell Terms below for details. These racing craft can get moving fast - sometimes 15 mph - with an experienced crew. You row facing backwards using your legs, back, and arms (in that order). You sit on a sliding seat with your feet in stationary shoes or sandals. You use one large oar (about 12.1 feet long) in a 'sweep' style shell and two oars per person in a 'scull' shell (each about 9.3 feet long). The rowing machines (ergometers) seen in health clubs are great for the rowing motion and physical conditioning, but give no sense of the balance, timing, or oar bladework required on the water. Add in other people and you have a sport that demands both individual and team excellence. Shells vary in length from 24 to 27 feet (for a single) to 45 feet (for a four), to almost 60 feet in length (for a full eight). Each shell weighs from 35 to 210 pounds, or roughly 10 + (R*25) where R is the number of rowers in the boat. Shells are pretty skinny at the beam (12-21 inches) but with riggers each shell spans about 5.5 feet in width. You will find a blend of carbon fiber, fiber glass, and wood in each shell according to the state of the art in material science of the times and preferences of the shell architect. A new single shell can cost as little as $4,000 while a new eight can easily reach $30,000. Shells of four and eight people get a bonus of an extra person in the boat who doesn't row. Coxswains face forward, steer, and coach the boat to perfection. A coxswain is responsible for the safety, direction, and performance of the shell and it's crew. Contrary to Hollywood, a coxswain (aka 'cox') does not yell "stroke!" unless he is having one or needs the attention of the Stroke (the stern-most rower). The cox is the only team member that faces forward in the shell, steers, and barks commands. The best coxswains are tiny (<120 lbs), bossy, and loud. Great coxswains are part helmsman, coach, and psychologist. "Hands On!" is a call to order by the coxswain to the rowers. The crew should become alert and be ready to handle expensive equipment safely after 'Hands On!' is heard. All unnecessary talk should end at this moment. Attention should be given to the coxswain until all equipment is returned home: shells and oars. "Way Enough! ": This means 'stop', on or off of the water. All rowers should be attentive and may alert of any potential collisions by giving the 'way enough' command . The coxswain then becomes responsible for making adjustments to clear the path. The origins of this command have been obscured and you may often see it as "Weigh Enough". From row2K: "Weigh" and "Way": "Weigh oars" is an archaic English command meaning to lift the oars out of the water, while the command "Give Way" originally meant to start rowing, because "way" means movement (as in "steerageway"). The Americans spell "Way Enough" (as in 'enough motion') as "weigh enough." They also drive on the wrong side of the road and drink their beer weigh too cold. Huh? Warm Beer? English say "Way" and Americans say "Weigh?" But wait, there's more: "Weigh Enough" is a wonderful reminder of good rowing technique. Because how do you actually "lift the oars out of the water"? You _weight_ the oar handles with very relaxed hands, reinforcing 1,000's of times of coaches saying "weight and unweight" the handles, which frankly is transformative. Hands On: The boat should always be lifted from the gunwales, ribs, or the foot stretcher tubing. These are the areas that can handle the stress. Never lift a boat by its rigging. Always stand in-between two sets of riggers; Never stand within a rigger. Moving: All land movement (boat lifting and carrying) should be done at a moderate and deliberate pace. The crew should slow down any time something feels awkward - make adjustments and if necessary ask the coxswain for assistance. Never allow circumstances to rush you and compromise the safety of the team or boat. Clear Riggers: When a shell is lifted the crew should be able to see all riggers. Each rower is responsible for making sure the riggers in front of them will clear any obstacles. Ideally the crew will alternate their sides and riggers to facilitate this need. Clear Bow: The rowers in front or nearest the direction of travel are responsible for making sure the boat/shell will clear any obstacles. All rowers should be attentive and call out any potential collisions as early as possible. Washing: Shells should be rinsed or washed after each row - inside and out. Exterior hulls should be wiped with a soft sponge to remove marine scum and followed with a rinse. Oars (blades and handles) should be rinsed with fresh water too. Racking: Always place a shell on ribs when racking the boat. Do not rest a shell on it's riggers. When securing a long shell to a rack it should be tied to at three points (front, middle, rear). The ties should serviceable: not torn, cut, or frayed. Shells must be tied down so as to defeat any gust capable of lifting, sliding, or throwing the shell off it's rack. Hardware check: Rowers are responsible for checking the tightness of nuts on their rigging and foot stretchers before each row and making adjustments accordingly. Bow and Stern Lights: During twilight rows all shells are required to have lit bow and stern lights. At BIAC each program is currently responsible for supplying this need. We hope to find a favorite solution that will work for all programs this year. Coxswains make calls to tell the crew what to do in any situation. The crew may advise the cox, but the final command is up to him or her. A cox must be alert and in control (of him/herself, the boat, and crew) at all times. The crew should expect to hear a prep call, and an execute call at a consistent cadence comfortable to both the cox and crew. The prep call tells the crew which command they are going to execute. The execute call then performs the required action. Each coxswain and crew will develop calls and cadences unique to the team. Sometimes calls will run together, like “Down to Waist ... and Down !”. Calls like "way enough!" have urgency and therefore no preparation, though a kind cox will time such a command to the rythme of the team. In general, the crew should be responsive to the coxswain's voice and with practice know what is expected from the cox's style, cadence, and tone. All movements by the crew should be done at a moderate and deliberate pace. (i.e., the boat should never be rushed, but at a pace that allows the entire crew to work together.) If the entire crew does not hear/understand a command, the boat should be moved deliberately enough to allow everyone to respond. If you find the boat moving unexpectedly, assist that movement because you may have missed a command. However, call "Way enough!" if you believe the movement to be unsafe. If any command is unclear, ask the cox for clarification or get help from a crew mate. Ready all ... Row! 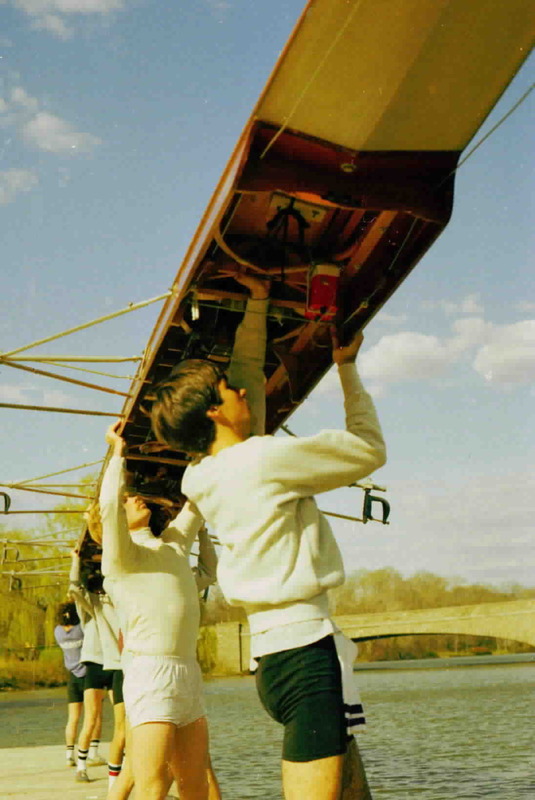 The crew starts rowing together from a static position. Way enough: The crew should stop all motion and await further instruction. Hands on: Get hold of the shell in a manner that will facilitate lifting or moving the shell. Count down from Bow when ready: A request by the cox to hear from the bow to stroke when all are ready. All Hold: Rowers must stop the boat with their oar(s) by squaring them in the water. On the paddle: Row with little effort just to move the boat slowly. Full pressure: Row as hard as you can - all out! Up and Over heads: lift shell over heads with arms upraised. Ports/Starboard To Oars : Rowers called will hustle to retrieve oars to the boat. Reach Across : Hold the shell from both sides by reaching over the hull and grabbing hold of the opposite gunwales. Bow: Front of the boat. Stern: Back of the boat. Port: Left side of the boat when looking from stern to bow. Starboard: Right side of the boat when looking from stern to bow. Shell: Another word for the rowing boat. Sweep: A boat in which each rower has one oar. Scull: A boat in which each rower has two oars. Single (1x) : A scull for one rower (a sculler). Double (2x) : A sculling shell for two rowers, each holding two oars. Four (4+): A shell for 4 rowers, each holding a single oar. Includes a cox. Quad (4x): A sculling shell for 4 rowers, each holding two oars. Eight (8+): A shell for 8 rowers, each holding a single oar. Includes a cox. Gunwale: (pronounced "gunnel") The top edge of the side of the boat. Oar Lock: A loose clamp outward at the rigger's end that holds the oar and lets the oar pivot. Rigger: The tubular extensions extending from the gunwale to the oarlock. Fin or Skeg: A small keel fixed under the stern of the hull to help it glide straight. Foot Stretcher: The shoe or sandal assembly into which strap your feet in a shell. Oar: Sweep oars are about 12 feet long. Parts include blade, shaft, collar, and handle or grip. Seat : The sliding seat that enables the rower to deliver power with the legs. Rudder: A palm-sized movable fin behind the skeg used for finely steering a shell. Bow: The rower nearest the bow of the boat. When the boat has no cox, as in a double or a quad, the bowman steers the boat and issues commands. Stroke: The rower nearest the stern of the boat. The stroke sets the boat's rowing pace. Coxswain: Also called a "cox", The person who steers the boat and calls commands. The coxswain eithers sits in the stern or lies in the bow giving commands to the rowers. 1, 2, 3, etc. : It is common to refer to rowers by numbers. Bow (1) through Stroke (8). Catch: The start of the drive where the oar is placed into the water. Drive: The propelling part of the stroke using legs, back, and arms (in that order). Finish: Where the oar is taken out of the water. Recovery: The slide forward with the oar out of the water leading up to the catch. Feathering: Turning the oar blade horizontally. Squaring: Turning the oar blade vertically. From/at the Finish/Catch: Get ready to row from this stroke position. Paddle: Row easy, no power on the stroke. Half Power: A step up from "paddle." Next step is 3/4 power then Full power. Full Power: Take strokes at full power. Way enough: Finish the stroke in progress and stop rowing. Hold or Hold Water: Square the oar in the water (to stop the boat fast). Check it: Same as "Hold or Hold Water". Arms only: Term used by coxswain instructing rowers to use only arms in rowing. Back (it down): Row backwards (slowly). Set! : The boat is leaning to port or starboard and needs to be leveled. (Stroke) Rating: The number of strokes taken per minute. (Catch a) Crab: When the rower looses control of an oar, usually when the blade gets stuck in the water. This can sometimes stop the boat or eject the rower into the water. Skying: When the blade is too high off the water just before the catch. Digging: When the blade is too deep in the water during the stroke. Washing-out: When the blade starts to come out of the water during the stroke. Rushing: Being too fast on the recovery and ahead of everyone else. Shooting Your Tail: Using your legs at the catch before your back is set. This results in your seat moving but the blade handle going nowhere. Looks as funny as it sounds. Swing: Attaining aquatic Nirvana where everyone is in tight synchronization. 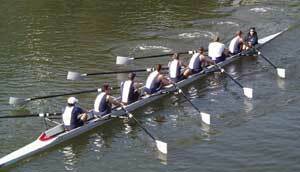 Head Race: Generally a Fall regatta, typically rowing upriver over a winding course covering several miles. Races are timed start to finish, rather than 1:1 parallel racing. Sprint Race: Generally a Spring regatta of 2K (2000 meter) races. As many as eight shells may line up in parallel and race each another over a straight course to the finish line. Erg: Short for Ergometer. A land based pain machine commonly in little use at health clubs. An erg uses a rowing stroke motion and measures various statistics such as power, length, frequency, distance, and time. Ergs have a sliding seat and a rowing handle used to spin a caged fan blade. Ergs are great for style, warmup, and endurance training.